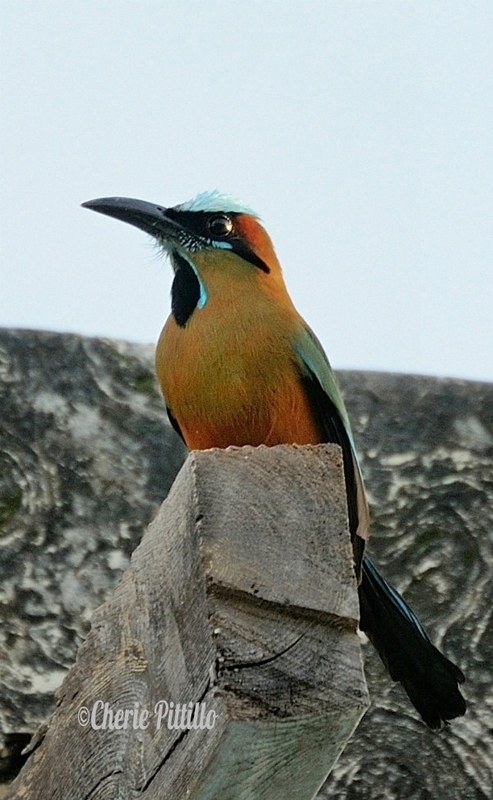 Turquoise-browed Motmot at Dzibilchaltun Archaeologoical Site just outside ticket area. 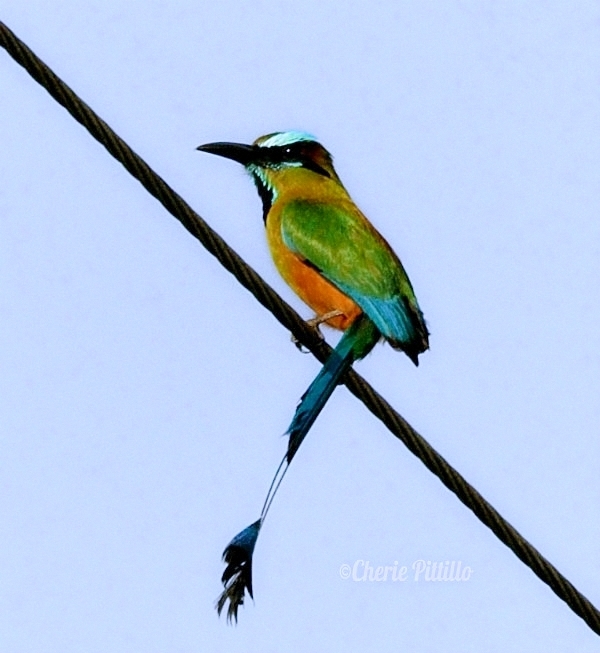 When I saw seven motmots perched on a utility line at the same time, I couldn’t believe the kaleidoscope of colors. Usually I spot the silhouette of this bird with its “telltail” signs resting on a shady tree limb at our many archaeological sites, haciendas, gardens, or even my Merida backyard. 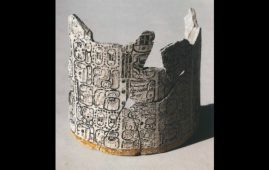 I often see it just before the ticket entry to Dzibilchaltun ruins. It also alights on wires along our roadsides as if to say, “Let me brighten your day with my beauty.” In the Yucatan Peninsula, the Turquoise-browed Motmot or Toh is a stunning, common resident and its range extends down to Costa Rica. This is a species of contrasts, as this gorgeous bird does not have a voice to match its magnificent plumage. 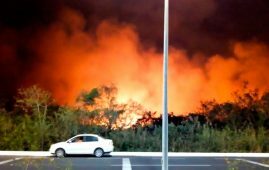 In this recording several sound like frogs followed by the typical call. Although the 13-15 inch Turquoise-browed Motmot preys on insects, spiders, small lizards and snakes, it includes fruit in its diet. 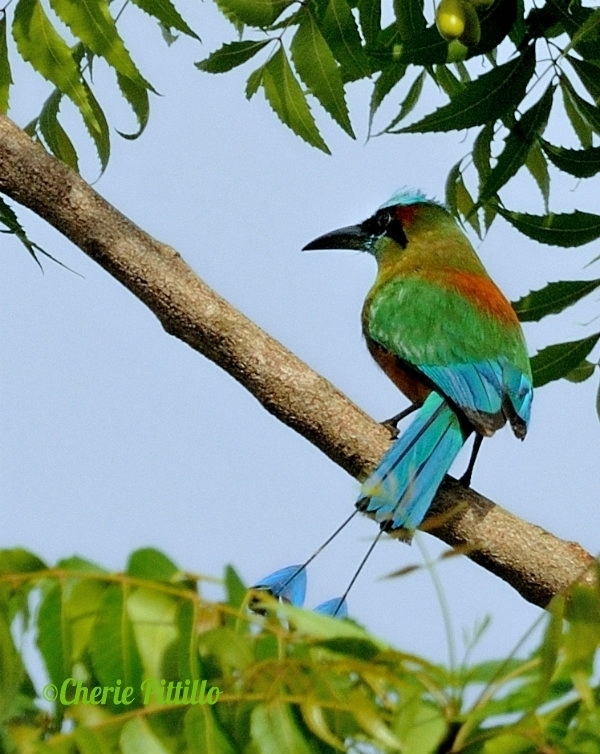 It seizes some insects in the air or snatches other motmot goodies from the ground. The motmot beats its live prey on a tree limb to kill it. I didn’t expect this species with its marvelous tail to nest in a cave, well, rock quarry, cenote, hacienda wall or a tunnel that it makes. 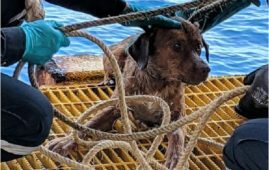 What a surprise to see one fly up out of a well! Turquoise-browed Motmot perched at hacienda wall and lacks two central tail feathers. 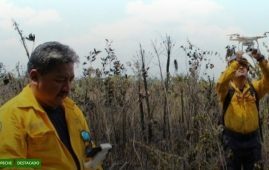 Where habitats permit digging, such as earthen banks, each bird of a mating pair takes turns to dig out a tunnel from two to eight feet long and about three inches wide. The motmot goes into the burrow face forward to scratch out the dirt and then backs out. That action probably protects those tails, which both sexes have. Furthermore, males and females look alike. Both parents incubate the two to five eggs, which hatch in about three weeks, and feed their brood. In about a month, the young fly from the nest. Additionally, the wag-tail display may serve as a false signal to a predator or unseen predators just before a motmot feeds its young. Size matters in mate selection. Studies show a female chooses a male with the largest tail and longest tail shaft. (No comment.) They have greater pairing and reproductive success. Her tail plumage doesn’t function as a sexual signal but his does. Perhaps he is “feather vain”. So why is part of the feather vane missing on the tail? Misinformation abounds about the denuded shaft. 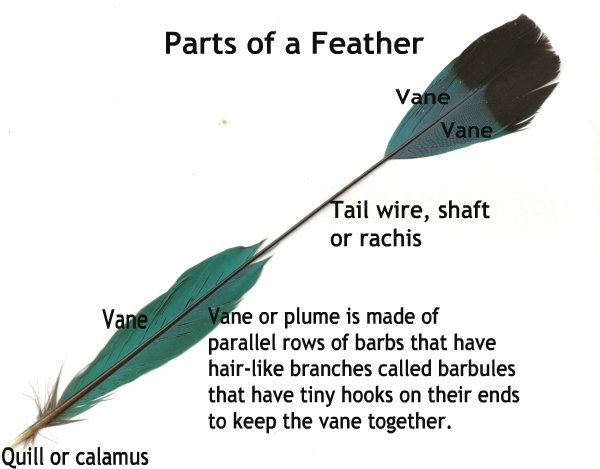 People thought the bird deliberately plucked the barbs out of its tail. Instead, the loosely attached barbs come out easily during routine living. 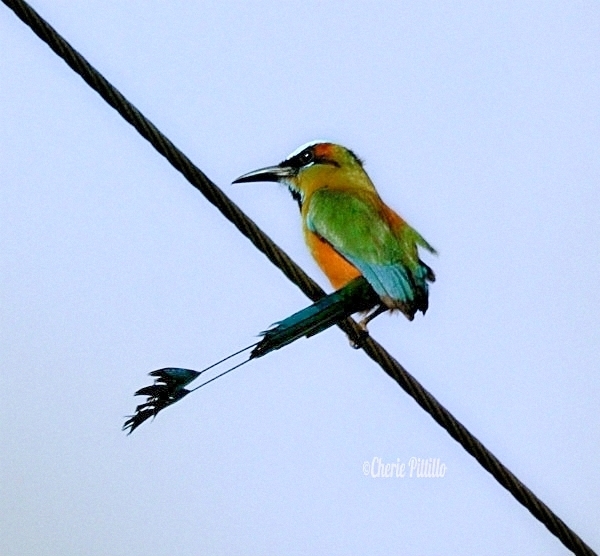 However, I am curious why this motmot’s tail has uneven wires, as I’ve not seen others like this. 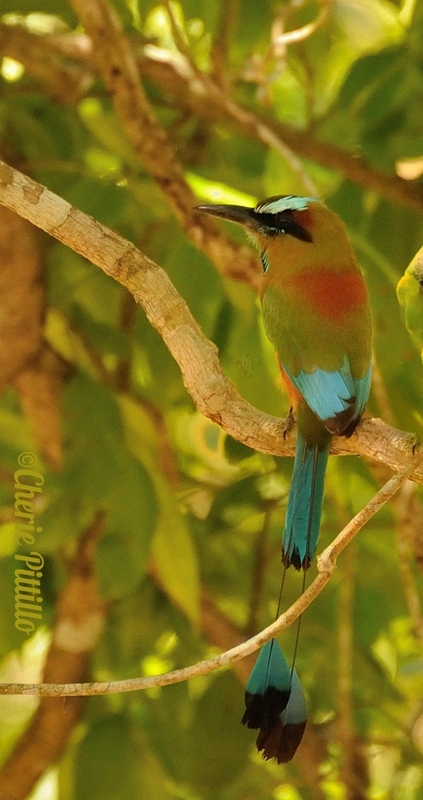 A cousin of this motmot species, the Blue-crowned Motmot, lives in the Yucatan Peninsula. I seldom see this one but got one quick image of it hiding under a leaf. Note the shorter tail shaft than the Turquoise-browed. 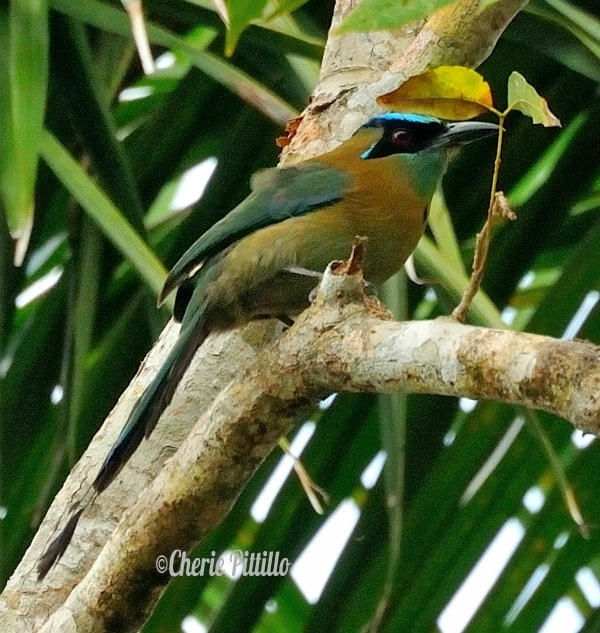 This motmot has its halo-like crown, not its brows, in blue plumage. 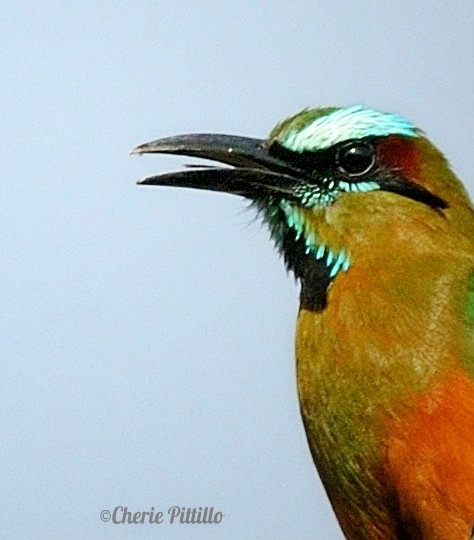 Its eyes look like a KISS rock star unlike the Turquoise-browed Motmot with its Amy Winehouse-lined eyes. DISCOVER NATURE’S SPLENDOR IN YOUR OWN BACKYARD. 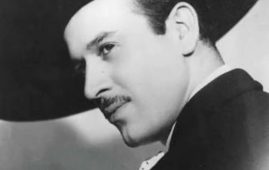 IT’S OKAY TO GO OUT AND SHAKE A TAIL FEATHER! As we have all come to expect, Cherie, your article is full of good information and fabulous photos! Thanks for sharing! My joy to share what I learn, Barbara! I signed up for a bird behavior class with Cornell. Hopefully I’ll share in the columns even more details on behavior.